Sizes for electric guitar tops. Indian rosewood guitar top type 'B' grade A*. Indian rosewood became the standard wood of choice for fine guitars as the availability of Rio rosewood began to wind down in the 1950’s and 1960’s. C. F. Martin and co famously changed over from Rio rosewood to Indian rosewood in 1969.Indian rosewood grows to larger sizes than most rosewood species and well produced quarter sawn sets and value for money are the norm. 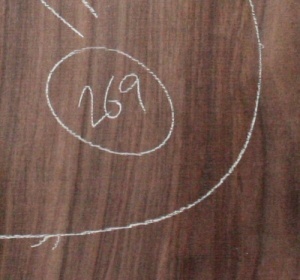 The supply and export of Indian rosewood is comprehensively and strictly controlled by the Indian government and future availability looks good. All Dalbergia species are CITES listed and require a special permit for export. We regret that for practical reasons we are not able to supply this item to countries outside the EU. 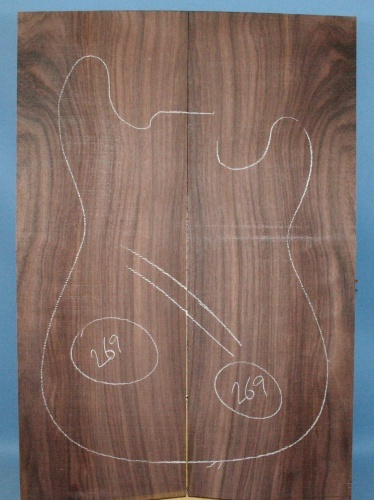 The sizes listed below are typical for our electric guitar tops. There can be variations. Please tell us the length and width of the guitar you want to make and we will select the most suitable blank for your purposes. Type 'A' is for carved les paul type tops.